With the Internet of Things (IoT) continuing to be a hot topic throughout 2014, across all industries — whether it’s about smart cars or intelligent kitchen appliances — more consumers and businesses are now aware of the advantages of being connected to the internet. It’s a concept none more relevant than to security professionals and business owners trying to ensure the safety of their organisations. This is when video surveillance-as-a-service (VSaaS) becomes useful for managing and archiving video footage captured by surveillance cameras onto cloud storage. Video surveillance systems can be a powerful tool in preventing or investigating crime when installed in locations such as shopping centres, parks, banks, airports, and other public transport locations. Rapidly increasing demands for video surveillance systems have been driven by growing safety and security concerns worldwide. According to Transparency Market Research, the video surveillance and VSaaS market is expected to reach a value of $42.81billion by 2019, growing at a CAGR of 19.1% from 2013 to 2019. By system, the IP based video surveillance market is expected to grow rapidly at a CAGR of 24.2% during the forecast period from 2013 to 2019. The hardware market was valued at $9.49billion in 2012 and is expected to grow at a CAGR of 17.3% during the forecast period from 2013 to 2019. It comprises of analogue and IP-based video surveillance cameras, recorders and storage, encoders, and monitors. The recorders and storage segment held the largest share of 37% in 2012 of the total hardware market followed by surveillance cameras with a 32% share but is expected to lose share in the coming years due to a growing preference for cloud-based storage (VSaaS). Also, the share of surveillance cameras is expected to increase to around 46% by 2019 owing to the growing popularity of IP-based video surveillance cameras that offer better video quality and have in-built recorders. Cloud storage will inevitably grow and grow throughout 2015. A recent survey by the Centre for Retail Research (CRR) in conjunction with Axis, questioned nearly 300 UK retailers, encompassing over 20,000 stores, about how they would like to access in-store surveillance footage and whether access from a mobile device would be beneficial. The results showed that majority of UK retailers (82%) wanted to view in-store video remotely – a rise of 6.5% from 2013. This obvious drive for the need to make ‘real time’ decisions based on the footage was reinforced with over 68% of retailers wishing to use a mobile device (eg. smartphone or tablet) to access in-store video. Scalability doesn’t just factor in the need for more cameras, it also enables access to more computing power and storage if, for example, a higher resolution or faster frame rate is needed. In another example, if analytics are needed for customer traffic pattern analysis, the processing capacity is already there and only paid for when required. Better functioning analytics running on the edge are also appropriate for critical infrastructure applications. For instance, the extra computing power could be used to store half a million car number plates and also capture registrations from cars driving past at up to 24 miles per hour. Another interesting aspect of VSaaS is that it offers users the possibility to add additional services to their video surveillance – such as guard force or remote monitoring services. Analytics technology is also likely to finally take off within the surveillance industry from 2015 – enormous amounts of structured and unstructured data (big data) essential for gaining valuable insights. 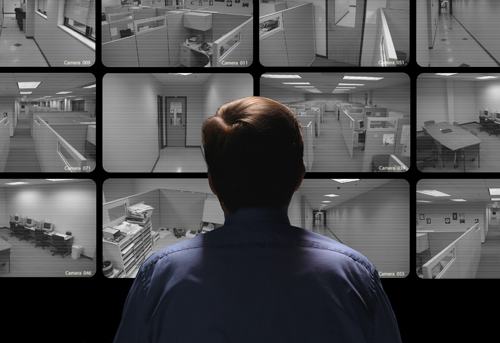 With network cameras’ capability to provide higher resolution video and to be connected from everywhere and around-the-clock, security departments are receiving more information from more sources. Therefore, more analytics are needed to help organisations make sense of the tremendous amount of information, such as images and videos. Increasingly intelligent applications are needed to help categorise and interpret the wealth of information, so it can be turned into something useful. The ‘three Vs’ of big data; volume, velocity, and variety, can provide vital information during a crisis by providing the right data at the right time. By starting with more factual data, such as surveillance footage, physical access control data, and cyber activity information and then building useful associations, costs can be reduced by only searching for the most relevant information. This is where IP video transforms the surveillance camera from a forensic tool aimed at solving problems to a proactive tool designed to improve business processes. According to the CRR retail survey, integration with BI applications was the single most important reason for UK retailers to migrate to IP video, with 27% citing it as their main driver. Nearly half of the UK retailers polled also said that people counting (49.2%) and queue management (49.9%) were the two most important non-security network IP applications that most interested them. There are several video compression standards including Motion JPEG, MPEG-4 Part 2 (simply referred to as MPEG-4) and H.264 – the latter being the latest and most efficient video compression standard and already the standard for video surveillance and other industries, such as entertainment. At the same time, the continual improvement in image resolution and light sensitivity for example, also increase the data output from the cameras – imposing higher demands on the efficiency of the video compression. Video surveillance manufacturers need to balance the upsurge in resolution with improvements to H.264 compression algorithms to make sure network bandwidth and storage costs do not spiral out of control. A combined effort of working on noise reduction methods and bit rate reduction should run in parallel with investigation into new video codecs to get the best results. Beyond improvements in current H.264 compression, the future will embrace H.265 technology, which is rapidly gaining interest in the broadcast industry. H.265 can reduce bandwidth and storage demands by up to 50% under the right circumstances, so expect the technology to be introduced into the security industry over the next few years. It’s likely to be initially deployed in high-end, high-resolution cameras, and it’s expected that H.264 and H.265 will co-exist for a while within the industry. Ultimately, high quality images and videos such as 4K resolution needs to be supported by the right technologies in order for organisations to get the most out of their data, which can be analysed and turned into useful insight not only for security purposes, but also for efficiency to gain a competitive advantage. I believe this really should be the key consideration for everyone who is looking for the next ‘big thing’ in surveillance. Is wireless security the weakest link?